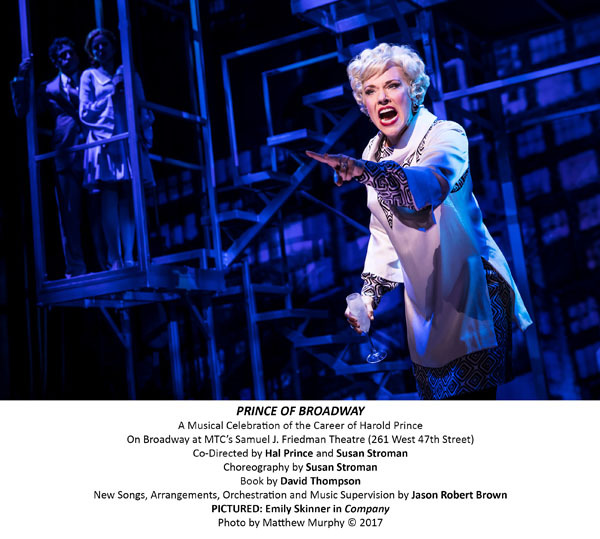 “Prince of Broadway” at Manhattan Theater Club’s Samuel J. Friedman Theatre (261 West 47th Street) is a celebration of the remarkable six decade career of producer/director Hal Prince. With each of the nine-member cast alternating in brief recollections by Prince, the focus remains on the songs from the musicals. 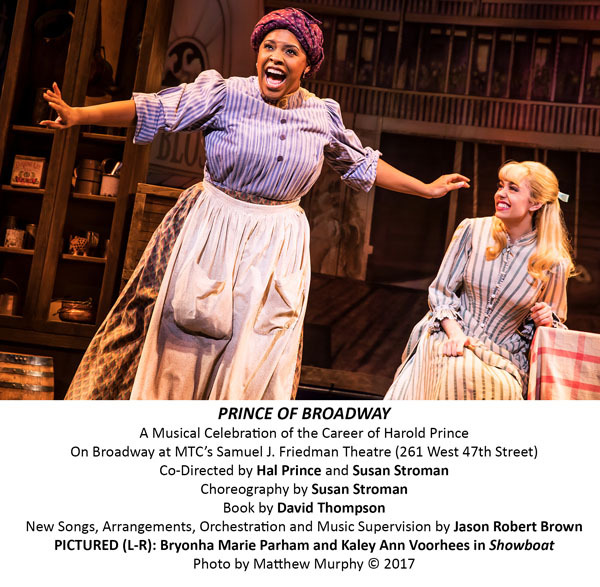 The show is co-directed by Prince and Susan Stroman (who also choreographed). While this would seem to be a surefire entertainment, it doesn’t consistently succeed. The overture arranged by Jason Robert Brown is vertiginous, squeezing in tunes from 16 disparate musicals. The scattershot feeling returns in the opening number, the lovely ballad “Hey There” from “Pajama Game.” Michael Xavier is not even given a chance to perform the whole song. The follow-up, “Heart” from the same 1955 musical (by Xavier, Brandon Uranowitz, Chuck Cooper and Tony Yazbeck) does hit a home run. 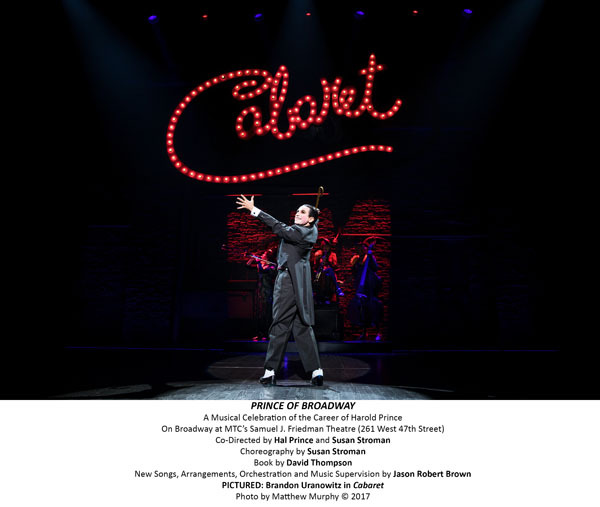 Much of the material is well performed but has been done in recent revivals that surpassed the renditions here (for example, “She Loves Me” and “West Side Story”). Beowulf Boritt (sets) and William Ivey Long (costumes) recall the originals but appear to be imitations. Obviously, a show with excerpts from 16 musicals can’t reproduce the scenery of “The Phantom of the Opera” with its ornate chandelier. Also, some numbers suffer from being taken out of context. The most unsettling is Uranowitz’s rendition of “If You Could See Her From My Eyes” from the Nazi era “Cabaret” with his closing line that the woman with a gorilla mask is Jewish. On the other hand, there are some wonderful numbers from shows that were commercial failures. Janet Dacal’s performance of “You’ve Got Possibilities” from “It’s a Bird …It’s a Plane …It’s Superman” with Xavier as Clark Kent is a delight. Some of the talented performers are given a chance to take on roles that they will probably never have a chance to do in a staged version. African-American Chuck Cooper has a good time with “If I Were a Rich Man” from “Fiddler on the Roof.” On the other hand, he is less successful with “Ol’ Man River” from “Showboat” where his voice lacks the necessary heft. Bryonha Marie Parham’s title song from “Cabaret” probably outdoes the version on the original cast album. While many of the songs are familiar (e.g., “Don’t Cry for Me Argentina” from “Evita” and “The Music of the Night” from “The Phantom of the Opera”), some of the best numbers come from the flops (e.g., Skinner’s singing “Now You Know” from “Merrily We Roll Along” and Yazbeck and Xavier’s “This is Not Over Yet” from “Parade”). Brown’s closing number, “Do the Work,” performed by the entire cast, is pleasant but not on the level of Irving Berlin’s “There’s No Business Like Show Business,” which would seem to be the model. In sum, “Prince of Broadway” confirms the brilliance of the producer/director’s contributions to the theater. At the same time, he might be better honored by a revival of one of the lesser known musicals, such as “It’s a Bird …It’s a Plane …It’s Superman” or “Merrily We Roll Along.